That's so much cash, for so little work, that it would be extraordinarily difficult for anyone to turn it down. And the precedent established by former Presidents Bill Clinton and George W. Bush, to say nothing of former Federal Reserve Chairs Ben Bernanke and Alan Greenspan and a slew of other high-ranking former officials, is that there is nothing wrong with taking the money. Indeed, to not take the money might be a problem for someone in Obama's position. It would set a precedent. Obama would be suggesting that for an economically comfortable high-ranking former government official to be out there doing paid speaking gigs would be corrupt, sleazy, or both. He'd be looking down his nose at the other corrupt, sleazy former high-ranking government officials and making enemies. There should be nothing wrong with a rich politician who has earned his wealth on the free market before entering politics. There is also nothing wrong with high-skilled politicians and bureaucrats alike being paid a wage that reflects their contribution to the general welfare. However, there is something gravely shameful about former politicians and bureaucrats using their influence in order to make profits by doing little more than providing their customers’ with prestige and influence than they would not have otherwise had. This is nothing less than prostituting out the presidency's prestige for Mr. Obama's own enrichment. It’s very easy to speak eloquently about change. However, it’s very difficult to change when it’s your own skin in the game. We are now seeing how much Mr. Obama really cares about changing American politics when he's the one having to abstain from the champagne and luxurious vacations. On September 30th, Congress will to vote on renewing the Export-Import Bank’s mandate. For almost eighty years, the bank has been giving credit subsidies to foreign buyers of American goods. Whether that mandate to subsidize exports has been for the general welfare is questionable. According to its advocates, the bank provides a valuable service by leveling the playing field. Even if Congress had scruples with supporting an institution as blatantly mercantilist as the Export-Import Bank, other nations like China would not, and if the United States did not support the bank, its economy would lose jobs to those nations who were willing to subsidize exports. In addition, at least according to its mandate, the Export-Import Bank is not supposed to finance projects that could have otherwise found financing on the private market, and the bank could therefore be construed as a reaction to the market failing to provide such projects with capital. Rather than being an institution which supports American business against the threat of foreign mercantilism, the bank provides help mostly with no justification, and mostly to large corporations who certainly aren’t about to go out of business because of foreign competition. Really, the Export-Import Bank is merely a mercantilist institution in which bureaucrats within the bank, with no skin in the game, get to arbitrarily decide where to invest in the economy. How they invest in exporting businesses isn’t determined by the calculus of profit and loss, but how the bureaucrats within the bank interpret their mandate, and interpret what is in everybody else’s best interests. Such behavior introduces the very real possibilities for malinvestment and political patronage, which is certainly not in everybody’s best interests. 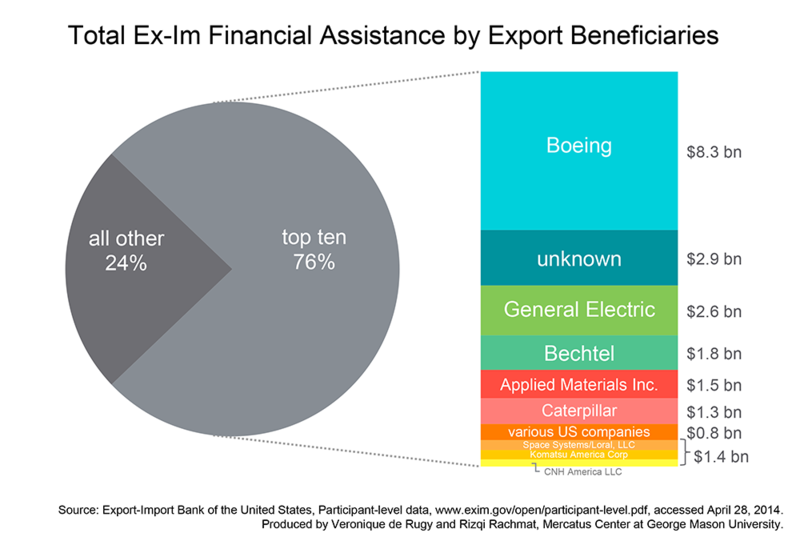 The Export-Import Bank isn’t fighting fire with fire; rather, it is an institution which provides support to those with connections to the government, and which unnecessarily meddles with the free market. Though Congress will likely extend the Export-Import Bank’s charter, the United States would be better off if they ended it. It’s an institution of crony capitalism which enrich the few that they protect at the expense of a, uncountable number of consumers, and should therefore be swept aside in the service of universal benevolence. More importantly, free trade is a simple and obvious way for increasing the prosperity of every human being on earth. Obstructions to free trade, like the Export-Import Bank, are simply artificial obstructions to humanity’s prosperity, and should be swept away like we would sweep away other artificial obstructions. What should one make of the revival of state capitalism? I don’t think that we should we be talking about the revival of state capitalism. The triumph of liberalism has been exaggerated in liberalism’s own post-70s renaissance. Great victories like President Carter’s Airline Deregulation Act aside, state capitalism has never really been put into full retreat. Freddie Mae and Freddie Mac, for instance, have been greatly involved in the American housing sector. State capitalism has continued to thrive despite the liberal tide, and that state capitalism has been so robust I don't think should surprise anyone. After all, what is there to eliminate state capitalism? If state capitalism disappeared, then there must have been some extinction mechanism responsible for that disappearance. Yet, there are no such reliable mechanisms out there. For state capitalism to abate requires a political crisis in which the leviathan’s legitimacy and ability to operate is challenged. In state capitalism, the state, talking about it singular agent, acts as would an investor in a free market. The leviathan dons a business suit and goes out into the economy with swagger to invest where it sees fit. Compared the private businessman, who is limited by the cash in his pocket and the loans he can muster, the leviathan almost have an unlimited supply of capital it can pour into its investments. It can reach into other people's pockets to support its enterprises. Has a railway gone bankrupt? Throw more money into the venture. Can a steel factory no longer pay its workers. Throw more money into the venture. Need capital to invest in a new project? The response is similar. For a state-capitalist venture to go teats up takes a political crisis. There has to be some shift in politics requiring that the leviathan no longer have the legitimacy to reach into other people’s pockets. Whether it has been caused by budgetary concerns or concerns of the legitimacy of what the state is doing, there must be a crisis for state capitalism to wither. Yet, most don't mind the state capitalism, otherwise known as crony capitalism, in their midst because it doesn't cost them much. State capitalism in otherwise liberal nations - and there is a lot of it, as The Economist points out here and elsewhere - survive by the principle of diffused costs and concentrated benefits. The leviathan can benefit a few at the cost of many without those many really caring. When a private enterprise has outlived its utility to other people, there is little that can be done to prevent its extinction. Death comes for all, and that holds true even for Fortune 500 companies. For death to come for capitalism, it requires a change in politics, and that is much easier said than done. Bad legislation and regulations have a way of carving out niches for themselves which become reasons for their own existence. As Oscar Wilde once wrote, the bureaucracy is expanding to meet the needs of the expanding bureaucracy. Tragically, there is not much that liberalism can do to fight that growth because of the principle of diffused costs and concentrated benefits. As long as voters are rich enough that they won’t mind that crony capitalists taking the dimes from their wallets, state capitalism will thrive even in a liberal society. That the leviathan continues to act as a capitalist shouldn’t be a surprise, and it’s continued existence is all but assured. Heads they win. Tails you lose. Forget the rule book. They make the rules. Wanna compete? You'll be rejected. Get with the Kronies. They're Konnected! This is certainly a problem, but its solution is not that the government and its officials need to involve themselves in the economy in order to take down massive companies and vested interests within the economy, the problem is that the government allows them to continue to thrive. The most pertinent example of this is how the United States has saved massive banks on Wall Street from their doom despite the questionable practices and foolish investments the banks made. Most recently it was TARP, but in the 1990s it was the rescue of American creditors when the Clinton Administration granted the Mexican government a $20 bn loan and the rescue of Long-Term Capital Management with a $3.8 bn bail-out from Greenspan's Federal Reserve. Losses and failure are the natural mechanisms that force organizations that no longer serve people's most urgent demands to go out of business. They are the forces that make it possible for new ideas and new ways of going about business to rise to the top for it ensures that those who are doing things right don't have to persuade those who are doing things wrong. Instead, they merely have to wait for those who are doings things wrong to go out of business. Though profits certainly have a more prominent role in the functioning of a free-market economy than losses do in the popular mindset, losses play just as important a role. Just as profits reward those companies that are servicing the demands of consumers and provide incentives for others to imitate the practices of the profit-making firms, so losses punish those that don't and provide others an incentive not to use their practices. When the government jumps in to prevent firms from taking staggering losses and prevents them from going out of business, they are disrupting the proper workings of the markets just as when they prevent firms from making profits. Companies that are making a loss must go out of business lest the scarce resources within society be committed towards uses that do not produce the goods demanded by consumers. In addition, whereas the failure of those companies would have provided an opportunity for companies with new ideas to take the place of those that failed with an incentive to try new approaches and to allocate their scarce resources in a different fashion than failed companies, the rescue of those companies by the government just serves to bolster business practices that are not in conformance with people's desires. It should come to no surprise to us just how dysfunctional American banking has been over the past decade when we keep in mind that the banks leading those practices have been bail-out whether by the Federal government or by the Federal Reserve. When the stakes are tail I win, heads I loose nothing (and still leave with a lot), there is no reason not to take the bet. Crony capitalism is certainly a problem in the United States as well as the entire world at large. However, it is not a crisis of capitalism; it is the foreseeable consequence of the government interfering with the workings of an organic system that is governed by its own abstract principles. Even the issue of money in politics, often the subject of much tearing of garments by modern progressives, is so obviously a consequence of a businessman's ability to influence the government yielding him profit. When the government does things like diverting funds from TARP in order to benefit Detroit car-makers or when a Federal bureau can prevent Boeing from moving production from one state of the union to another, it pays dividends to have influence within politics. The decried phenomenon of money in politics is then just a natural result of when political decisions can influence the path resources take within the economy. The answer to all of this is not for the government to take a harder stance against crony capitalists; to the contrary, it is for the government to stop producing the environment in which crony capitalists thrive. The government needs to be an impartial spectator to the day-to-day affairs of the American economy. It needs to allow companies, even companies as important to America's past as General Motors, to fail and it needs to allow those captains of industry that have made bad decisions to harvest their crop of losses. After all, there is another captain waiting to take the wheel, this time with new ideas. Only then will it no longer be profitable for businesses to invest in favor from the government and only then will the problems of crony capitalism within the American economy be mitigated.